Today is the day that East Lakeview craft beer lovers, scratch that - most Chicagoland craft beer lovers have been anticipating for months. Tonight at 5pm DryHop Brewers will officially open it's taproom and kitchen to the public, showcasing six craft beers ranging in style from hop-centric and traditional to Belgian and experimental and a rustic, gastro-style dinner menu. 1. Shark Meets Hipster – Wheat IPA (6.0% ABV): Your next love affair. Light bodied American Wheat Ale featuring truckloads of Galaxy hops. Expect strong notes of passion fruit. 2. Batch 001 – Chicago Common (4.6% ABV): Yes, our very first brew. Pre-prohibition Cream Ale and Steam Beer hybrid. It’s a session ale brewed with barley, maize, and wheat. 3. Velvet Divorce – Czech Pils (5.2% ABV): Paying our respect to those who were innovating long before us. The classic, crisp, and dry lager. 4. Judge – American Pale Ale (5.4% ABV): This year’s cool kid hop gets weird with last year’s love affair - Mosaic hops join Amarillo hops for this citrus bomb. 5. The Angry Samoan – Coconut Milk Stout (5.5% ABV): Baseball, BBQ, and coconuts scream summer. Jet black with a hint of coconut. 6. 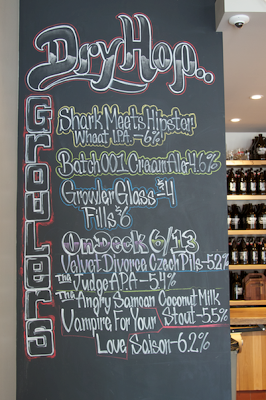 Vampire for Your Love – Saison (6.2% ABV): Belgian farmhouse ale brewed with Kafir lime leaves and Sichuan pepper. This is the only Saison that matters. Craft beer is social, so DryHop Executive Chef Pete Repak designed the menu to complement the ideals of community and respect for the craft of brewing. The plates are shared and each dish showcases the flavors and seasonality of the brewery. DryHop’s cuisine is unpretentious, everything is prepared from scratch and, the menu is constantly changing to focus on seasonal ingredients and elements sourced from local farmers and purveyors. DryHop’s late night menu embodies bold flavors that are slightly off center, and appeal to the inner foodie. DryHop’s dinner (5 p.m.) and late night (10 p.m.) menus are available starting Thursday, June 13. Lunch (11 a.m.), dinner and late night menus are available starting Friday, June 14. Normal business hours are Monday – Friday from 11 a.m. ­ 2 a.m., Saturday from 11 a.m. ­ 3 a.m. and Sunday from 11 a.m. ­ 2 a.m. The kitchen closes everyday at 1 a.m.
About DryHop Brewers DryHop Brewers is a brewery and kitchen in Chicago, Ill. DryHop brews hop-centric ales, in addition to traditional, Belgian, and experimental craft beers – all only available in Lakeview and to-go in DryHop’s 64- and 32-oz. growlers. 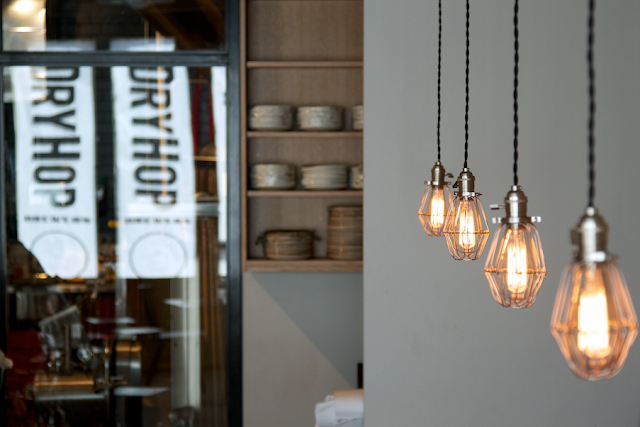 DryHop’s kitchen menu showcases the flavors and seasonality of the brewery through unpretentious shared plates. Visiting DryHop is all about being in a brewery; feeling connected to the craft brewing and culinary worlds; and most importantly, feeling a personal connection to a community of craftsman. For more information, visit dryhopchicago.com. 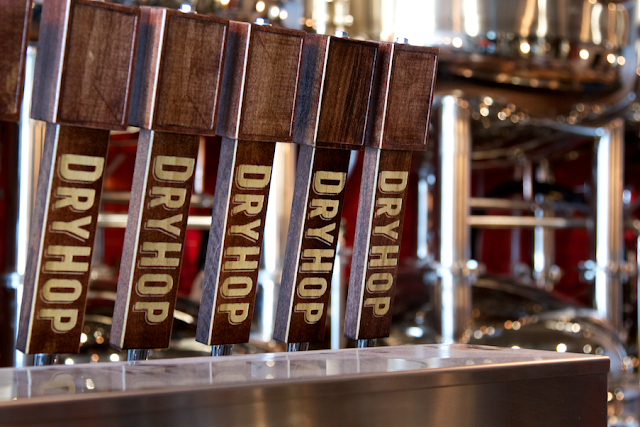 Follow DryHop on Facebook and Twitter @Dryhopchicago.